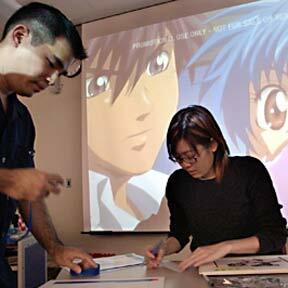 MangaBento co-ordinator Scott Yoshinaga, left, and Audra Furuichi, frame and label artwork while the anime "Full Metal Panic? FUMOFFU" screens behind them. MangaBento, a local anime art club, will have its work on display at Kawaii Kon, Hawaii’s first-ever anime convention, set for this weekend.